Jackson Racing Rotrex race kit proto - Miata Turbo Forum - Boost cars, acquire cats. This is a Jackson Racing Rotrex C30-74 supercharger set up, running at about 9.5psi (170kpa) on E85. Should bump a bit when we get full boost of around 14psi. Production blower and bracket but custom intercooler, piping and a programmable ECU (not CARB). Engine is a 1.9L BP6D race engine with our CNC ported head, Tomei cams, ceramic thermal coated chambers, valve heads, crown and exhaust port. RB header & exhaust, square top intake. Last edited by emilio700; 09-11-2014 at 12:46 PM. Not sure if you see anything, but it looks like your attachment failed. Emilio, how much of that power is coming from the SuperMiata motor? A good chunk of it? So on a normal BP, rough stupid ricer math says we could expect this setup to be more like 240whp? 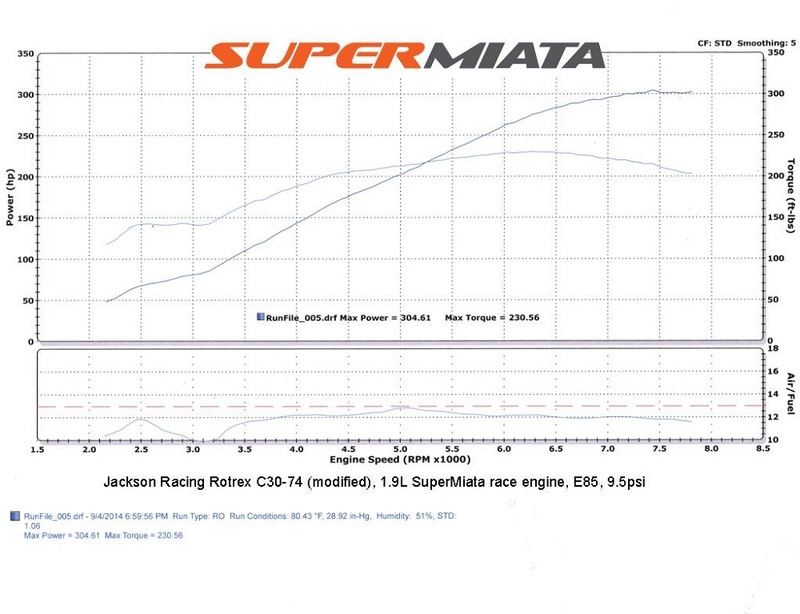 This is a Jackson Racing Rotrex C30-74 supercharger set up, running at about 9.5psi (170kpa) on E85. Should bump a bit when we get full boost of around 14psi. How are you going to bump up boost that much on a SC? Pulley changes or are you currently running a restrictor? I'll bet that car moves. As mentioned below, we are no making full boost yet. At the same 9.5psi, all other test variables the same but OEM NB2 engine, probably 250-260whp. That is a guess based some similar combinations we have run. We have a fancy ECU controlled WG setup that isnt tuned right yet. We figured 300whp is enough for this weekend at MRLS. From 5500-8000 it pulls nearly as hard as my C6 Z06. Car weighs 2150 w/o driver. 7.4lbs/hp vs 7.8lbs/hp for the Miata. This pulley/blower combo should make closer to 15psi on a stock engine and maybe 13psi on our betterbreathing whammy engine. That should be something like 290 and 330whp I think. There are two larger blowers for those that hate their rear tires. How about a stock BP and 91 octane instead of E85. Any estimates of power the kit could make? wow. May I ask what size pulley(s) you are running? There is no magic in pulley sizes. You really need to look at all the relevant parameters on your build and call Jackson Racing. They will help you figure out what pulley you need for your particular Rotrex setup. Gotcha. I was more curious how fast you were spinning the unit since you are revving a lot higher than most. Redline for the C30-74 is 120k, iirc from another thread this car is gearing the Rotrex to hit 120k at 8k engine rpm. I just want to go faster Mr Emilio, is this kit going to work for the average joe such as myself? How much would one expect to pay for someone to install this kit? So it is clear, the hardware on this car is one off. Only the blower/pulley/bracket are production parts. Installation would depend on your mechanic. Oscar Jackson himself can install a kit in less than 2hrs but I'd expect the typical shop to charge 4-6 hrs labor. I do have some leftover 'tools' from Ikea, so it should only take me 2 months. The Rotrex cars looked strong all weekend at MRLS. I had to make sure this wasn't a necropost from 2007. I had to make sure to troll all non-turbo F/I posts since 2007.